There was a rain delay, one Gools collapes, and one Sam retirement. Not an exciting day of tennis. BUT my Android takes really, really, really bad photos. WOOHOO. So let’s look at them and I’ll tell you stories while we do. Sound good? I had to Bluetooth each photo separately from my phone to my computer, which took abut 90 minutes of rain delay time, so you guys don’t really get a choice. 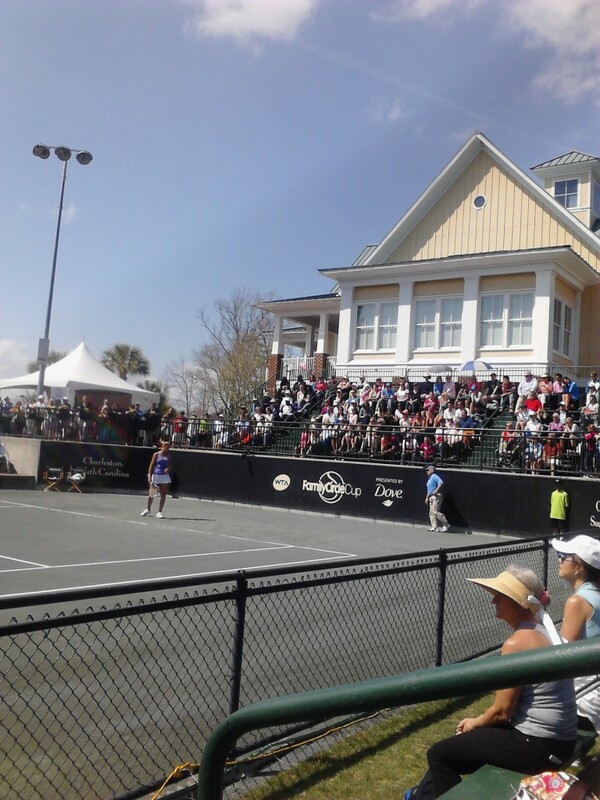 The first thing I saw when I came to Charleston was Taylor and Sloane hitting on stadium court. Actually, the first thing I saw was the two of them dying laughing while chatting, which made me really happy. 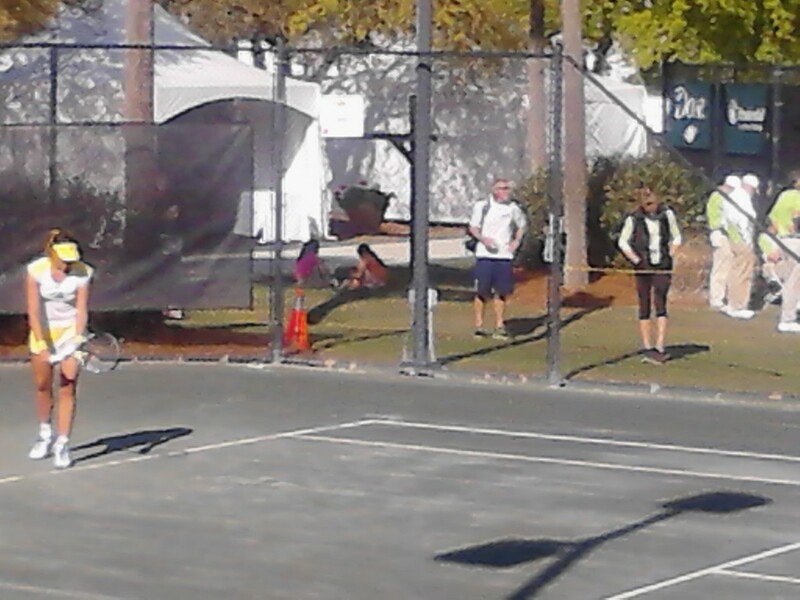 But I didn’t get my camera out in time to take a picture of that, so here’s Taylor hitting the ball. She’s awesome. It was nice to see her and Sloane laugh. 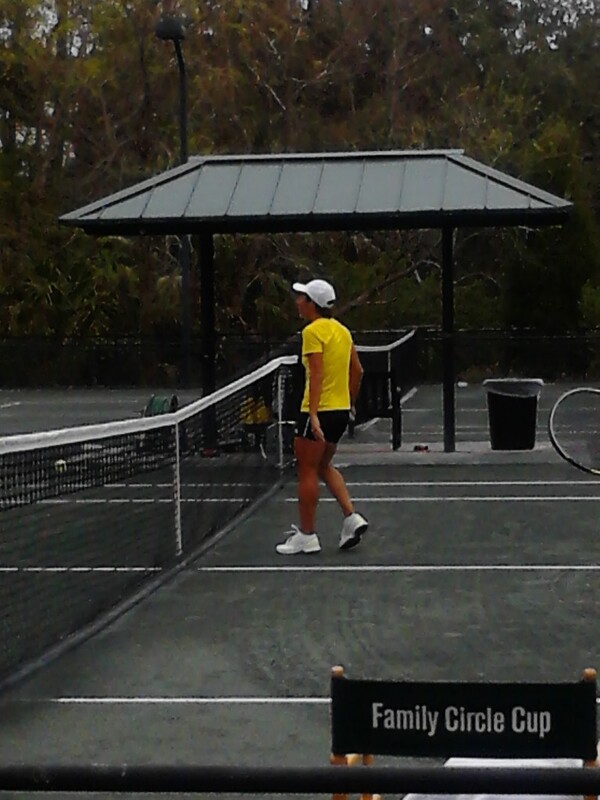 Also on Sunday, I saw Melanie practicing with Slava. 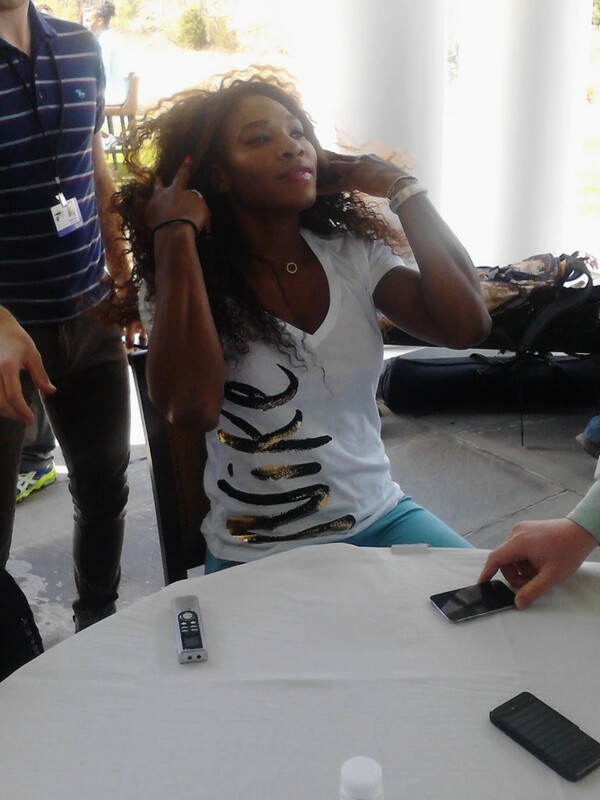 I must say that she looked awkward, stressed, and not extremely fit on the practice court. 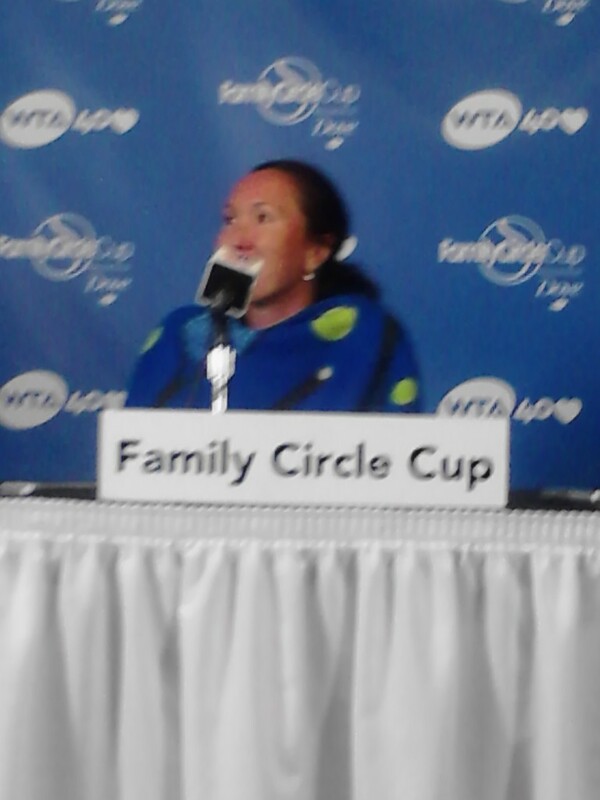 I was shocked that she gave Jankovic such a run and was so cheery in press. Slava just looks badass, all the time. She and Denis should play mixed doubles together in their shades and just be awesome. Speaking of badass, Fran invented badass. 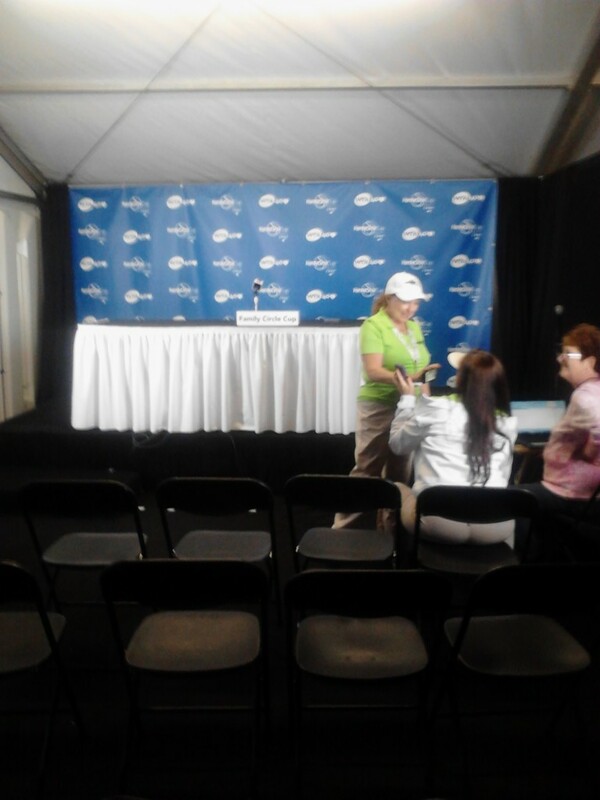 Too bad she lost so early, I was looking forward to experiencing a Fran presser. I hope I have another chance. STICK AROUND, FRAN. DON’T LEAVE US. 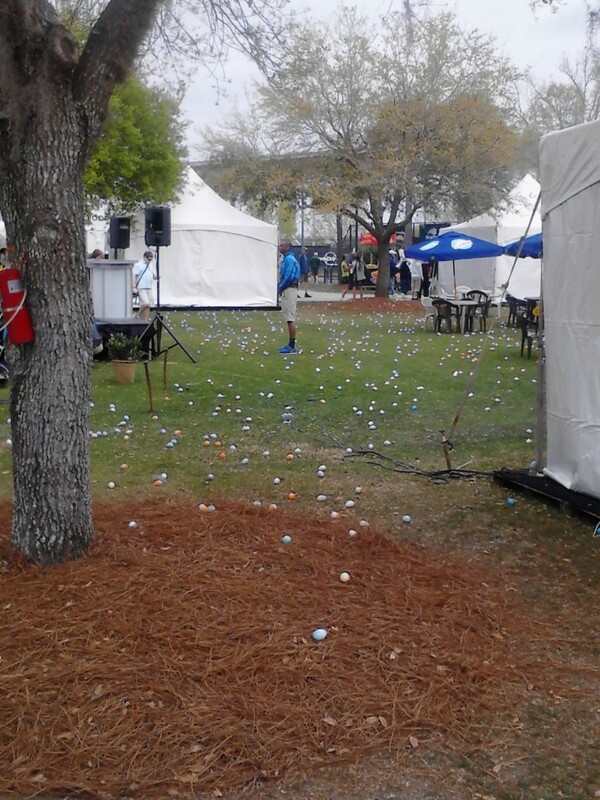 This was for an Easter Egg hunt. I think they forgot to hide the eggs. Oops. 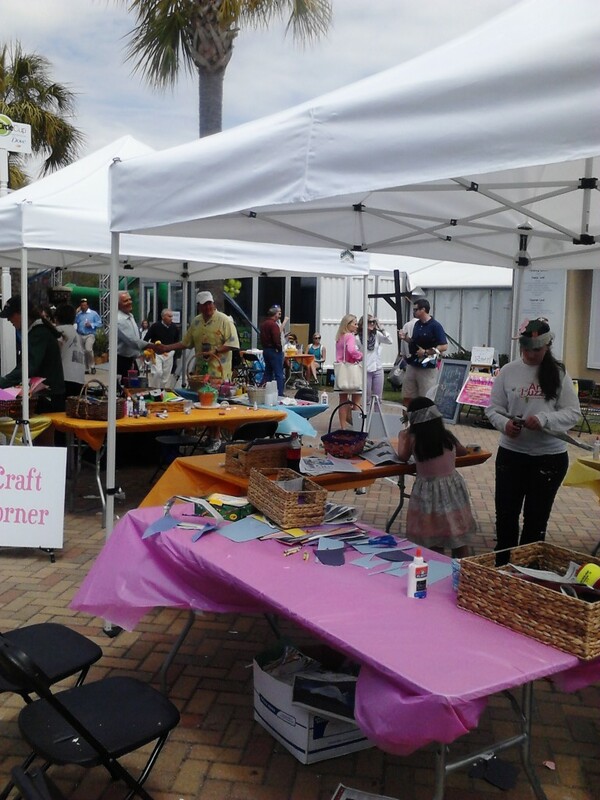 There were activities all over the grounds on Easter, which resulted in the biggest crowd I have ever seen on a quallies day. Spectacular stuff, and great for the game. That’s how to recruit new fans to the game. This is Karolina Pliskova on Athena Gibson court. 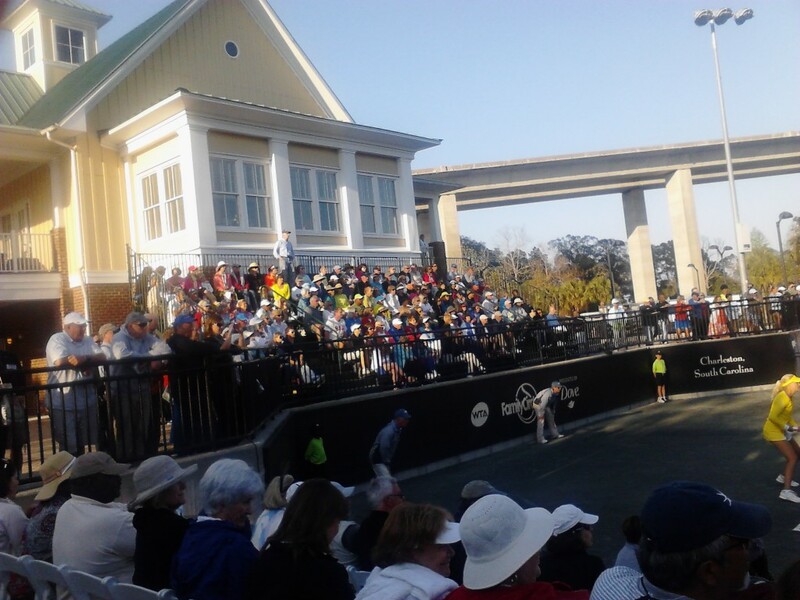 The “B” court here at the Family Circle cup is the best seat in town, especially since the clubhouse overlooks it. 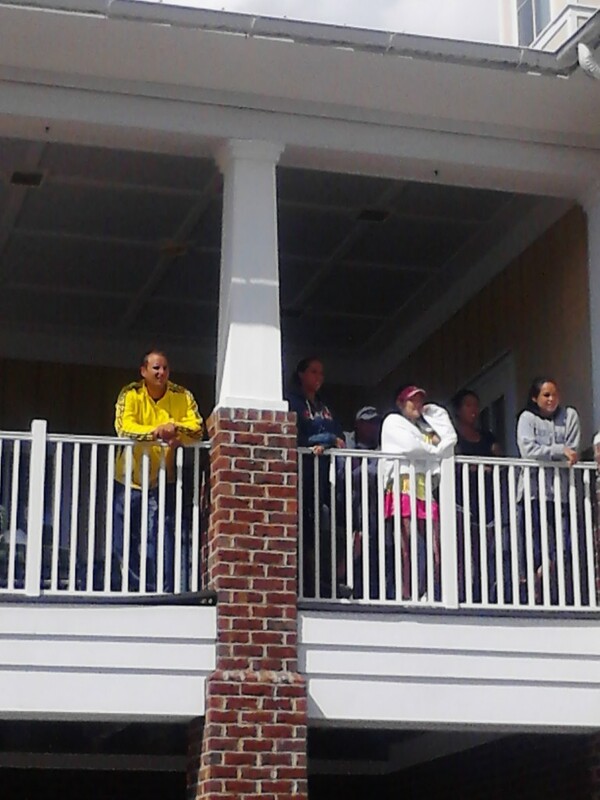 You can often see players watching matches from the porch, which is the best. Here’s a closer shot of Karolina Pliskova, since I know you were all DYING TO SEE MORE OF HER. You’re welcome. This is from All Access Hour, which happened at a country club because this is the South, so duh, everything that’s anything happens at a country club. That’s Sammy Stosur dealing with the press. 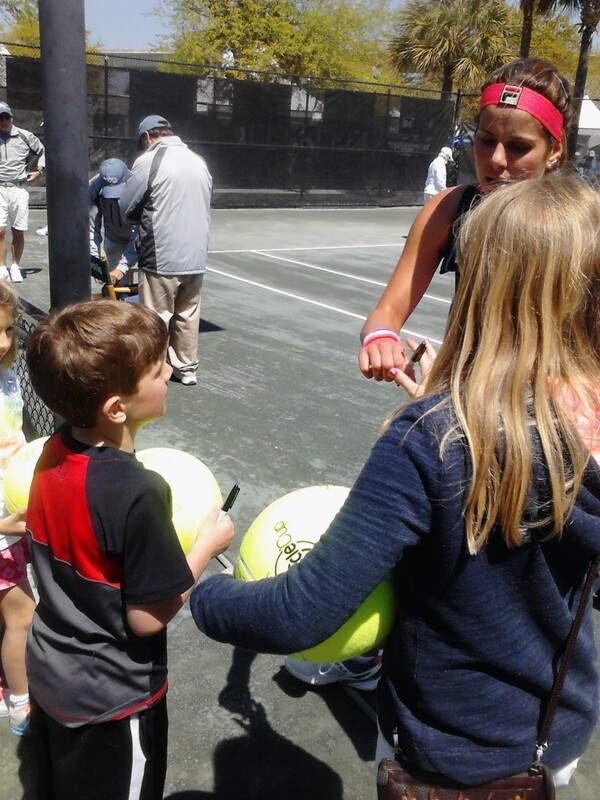 Here’s my new BFF Andrew Krazny talking with Sabine Lisicki. I interviewed Andrew today, and that will be coming to The Changeover next week sometime. GET HYPE, KIDS. Also, Sabine’s puppy. End of sentence. 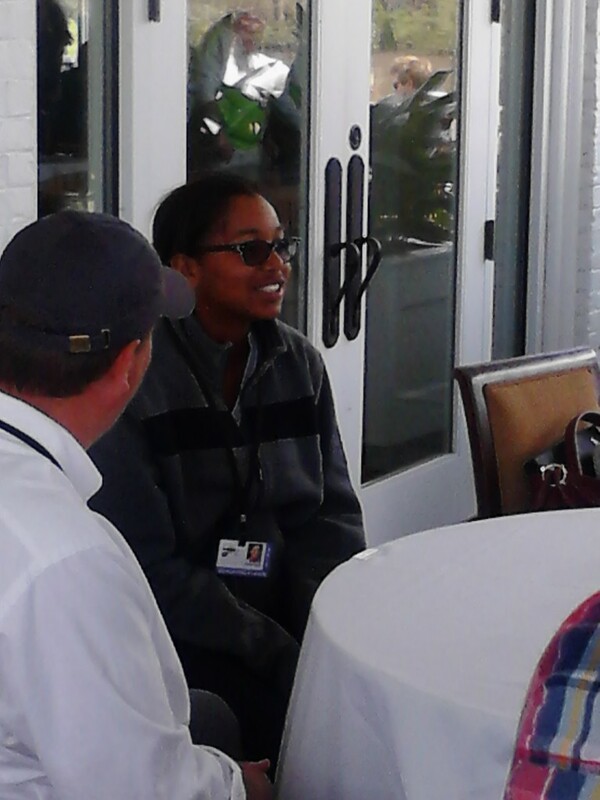 Victoria Duval, the QUEEN of the universe. Genie and Burnett after their match. I don’t think I watched any of this match. I can’t remember. Is that bad? I think that’s bad. OH RIGHT. I stopped to watch some of Genie because people on twitter asked me to, and therefore by the time I got to BMS/Rodionova it was way too late to be able to see anything. 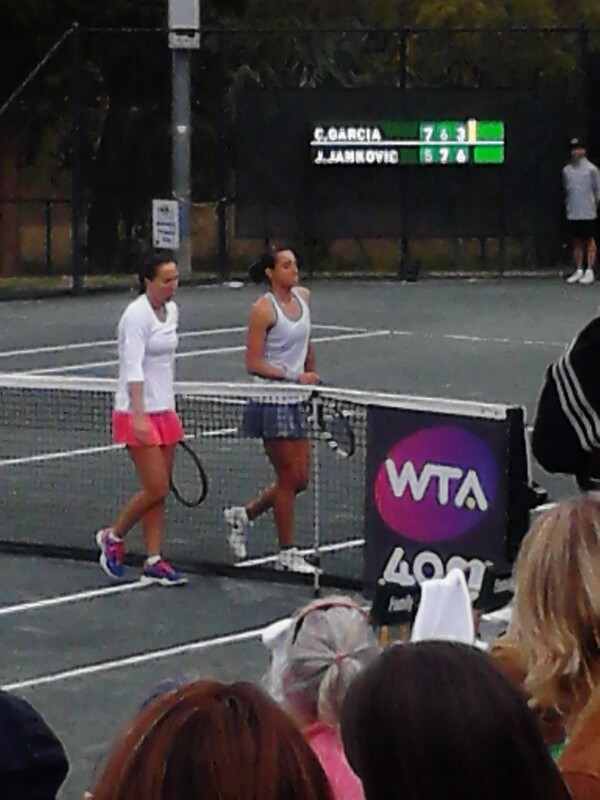 But I did snap this photo of Jamie Hampton et. al, watching the madness. My timing has been way, way off all week. 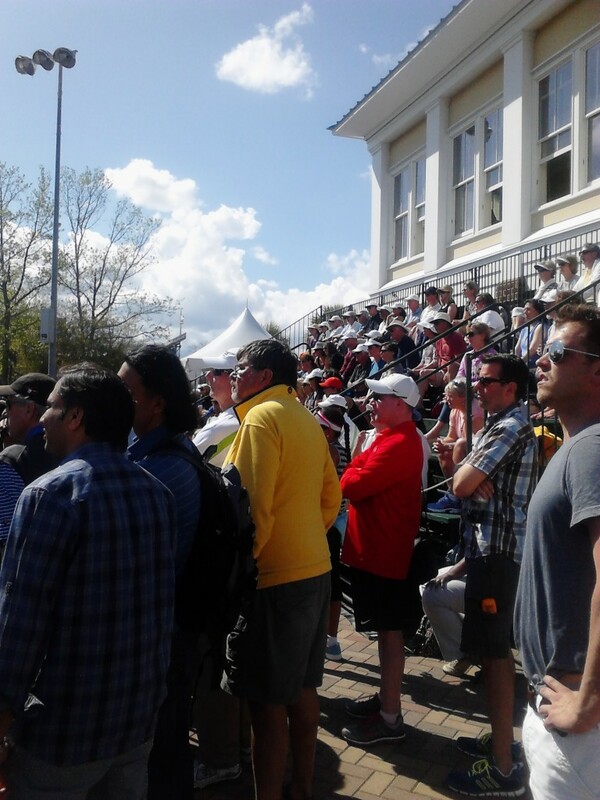 The stands were PACKED for BMS/Rodi. Everyone loves the crazy. Don’t ever let them tell you differently. Standing room only. I kept taking pictures of the crowd since I couldn’t see the match, and really it’s your fault that I couldn’t see the match because I listen to you guys and take your suggestions and ALL I DO IS LOVE YOU. 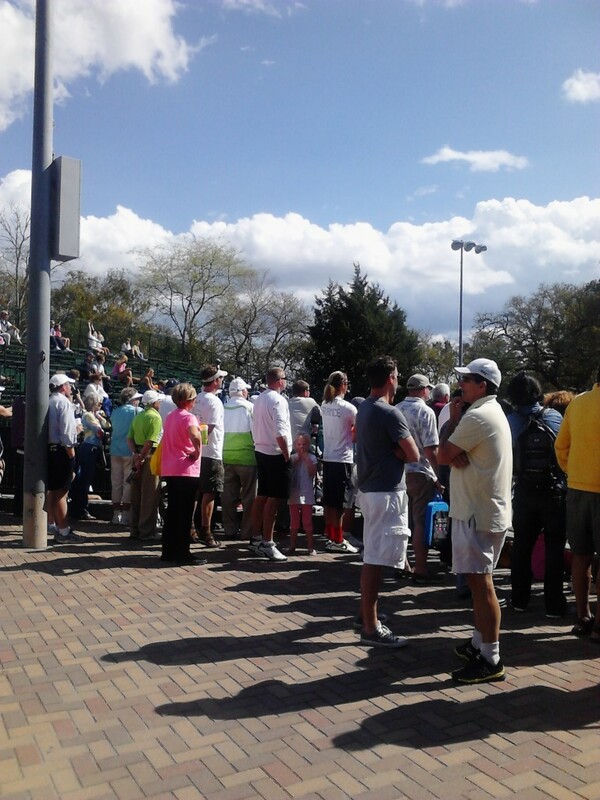 This is Mona Barthel scouting Muguruza and Pegula because she was going to play the winner. A) The scouting didn’t work at all because she lost to Pegula. B) Pegula/Muguruza was like the worst match I’ve ever seen in my entire life and I will hold it against both of them for quite some time. FYI. Oh, and I missed most of JJ/Melanie because of this. Everything is awful and you should feel really, really sorry for me. 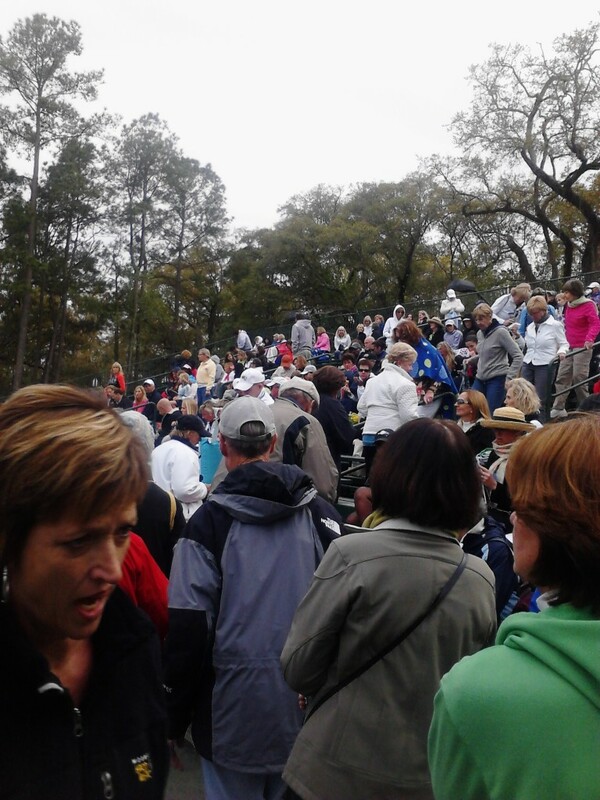 I was super excited to see Putintseva/Goerges, but the match wasn’t that great. At one point though Putintseva fell down and seemed to be really hurt. She sat there for a couple of minutes. The umpire ran out to see if she needed to get the trainer. She talked on her walkie. Gools brought over ice. But after about two minutes, Yulia bounced up like a jack-in-the box and said she was fine. It was pretty amazing. 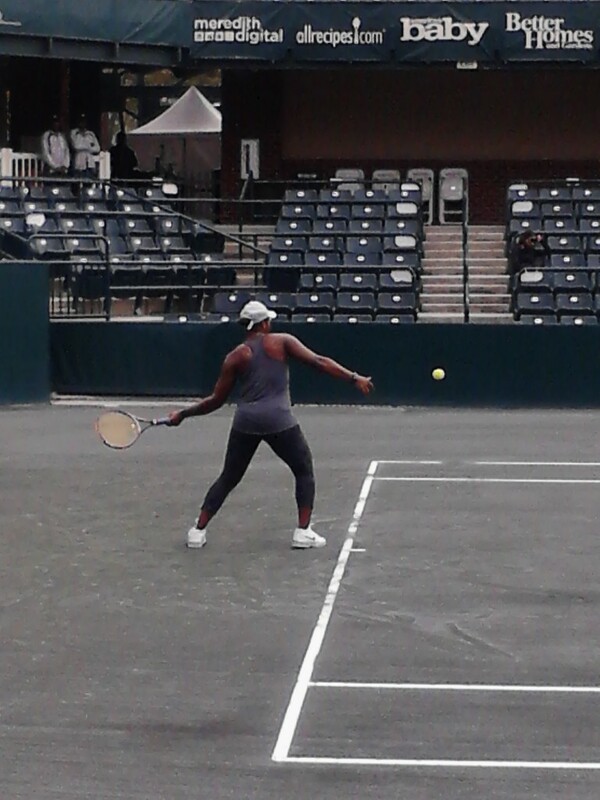 Here’s Gools serving. She was really fun to watch, her game is great to watch when on. But, you know, she apparently just lost to Voegele in three sets. Life. And Gools. Life for Gools. Here’s a winning Gools signing an autograph. Or attempting to. Whatever she’s doing it looks painful. 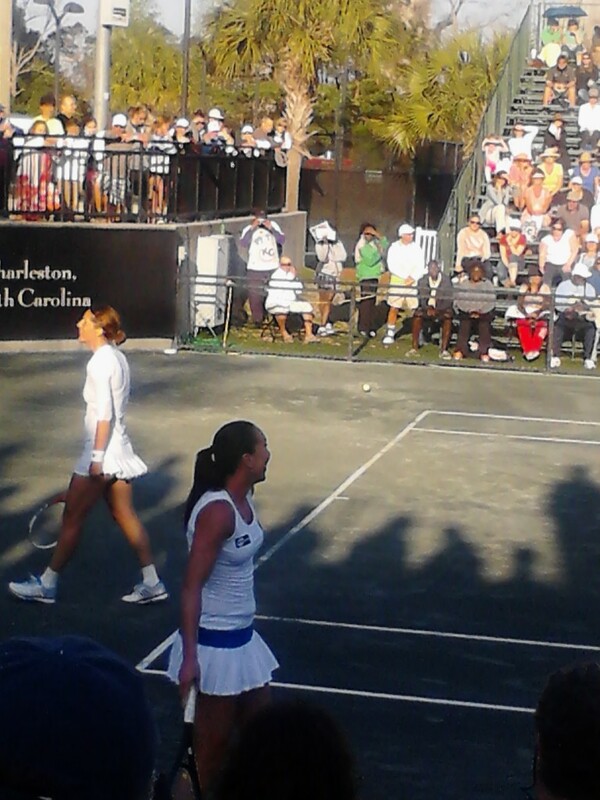 JJ and Petko laughing and being awesome. Their doubles match was one of the most fun things ever. After Petko shanked a shot that hit the umpire, she put herself in timeout. JJ went to comfort her. Comforting Petko meant a lot of laughing. Because JJ. And Petko. 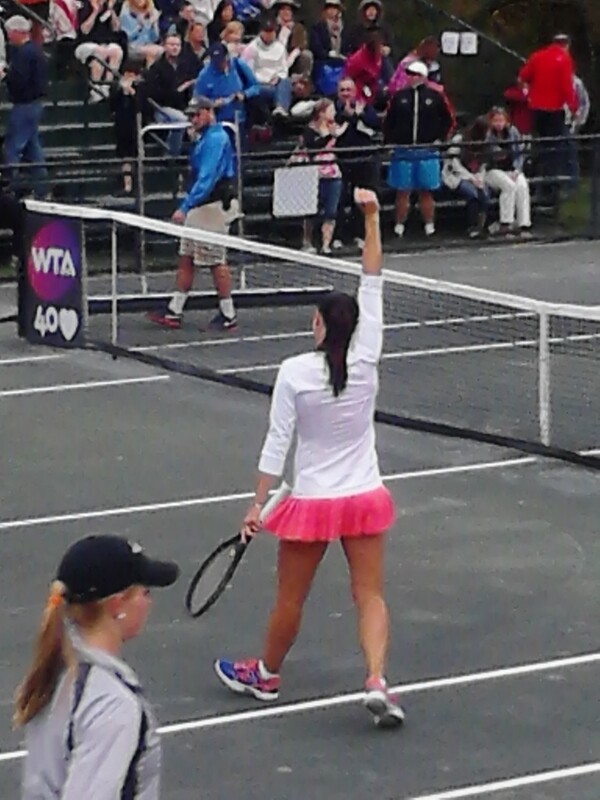 Because JJ and Petko. 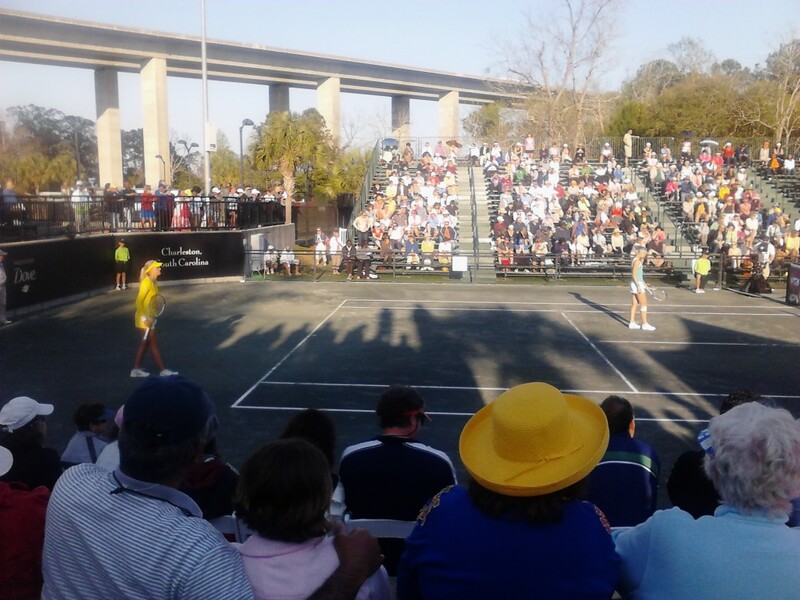 Here’s Lucie and Kiki and the awesome crowd during said doubles match. Kiki was by far the best one on court. Like, by far by far. I feel like if she could play doubles alleys in singles she would have 10 majors. 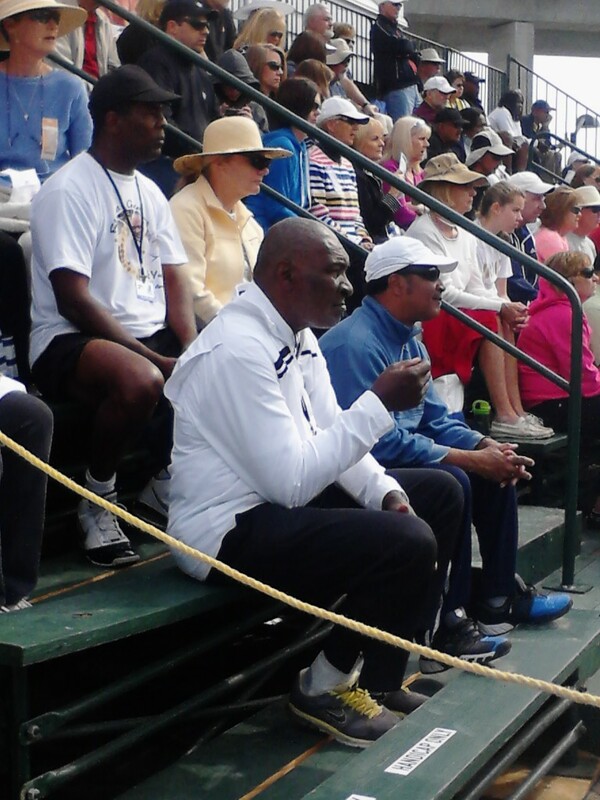 Here’s Richard Williams watching the Madison Keys/Grace Min match. I love how much he loves tennis, even after all these years. 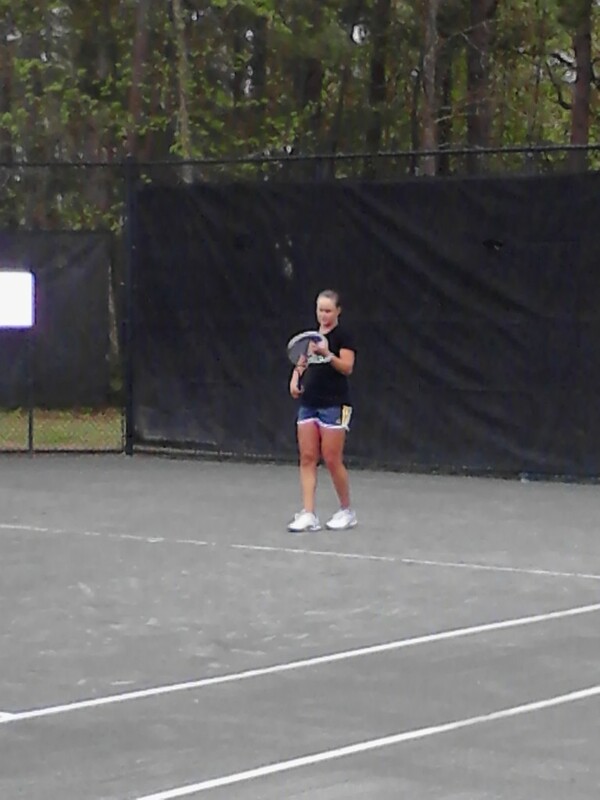 Here’s Burdette serving, and just being generally better than you. HERE IS A GIANT CROWD. I’m trying to remember what this was for. I thiiink it was for the Raymond/King doubles match. Yeah, let’s go with that. Awesome. She looks so young and so crazy. Now she’s just old and crazy. Seriously though, there are huge portraits of all the past champions everywhere you look around the grounds. It’s really, really fun to see. 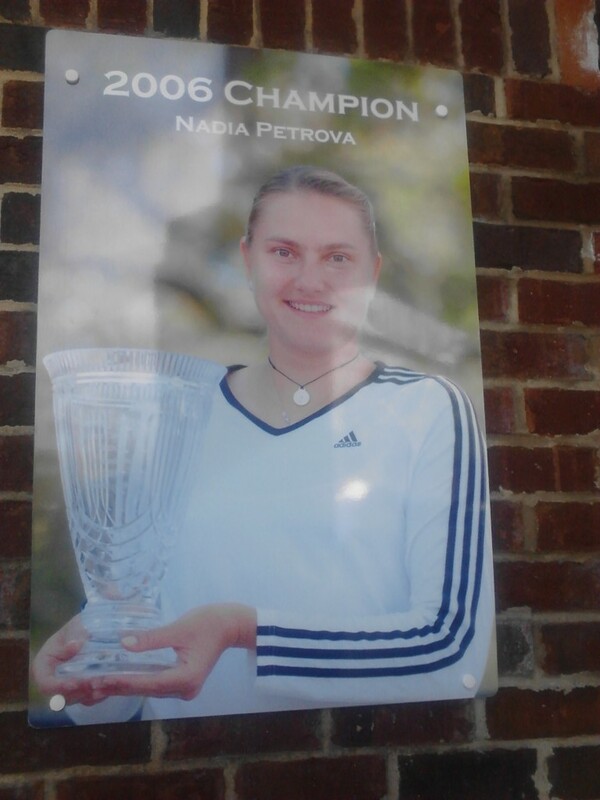 Also, WHY DIDN’T NADIA PLAY HERE THIS YEAR? I wanted to chat. Caroline Garcia played such a great match against JJ, but she just couldn’t close it out. If she ever learns to close out matches she will be a dangerous player. She is certainly fun to watch. Unfortunately, she left the court in tears. She had two MPs. JJ and her underoos. Always and forever. At least she remembers to wear them. JJ and Caroline after their epic. JJ really was happy, I swear. it was just a bad photo. Blame the Android folks, cheap bastards. See? Happy. She’s assumed the victory formation. 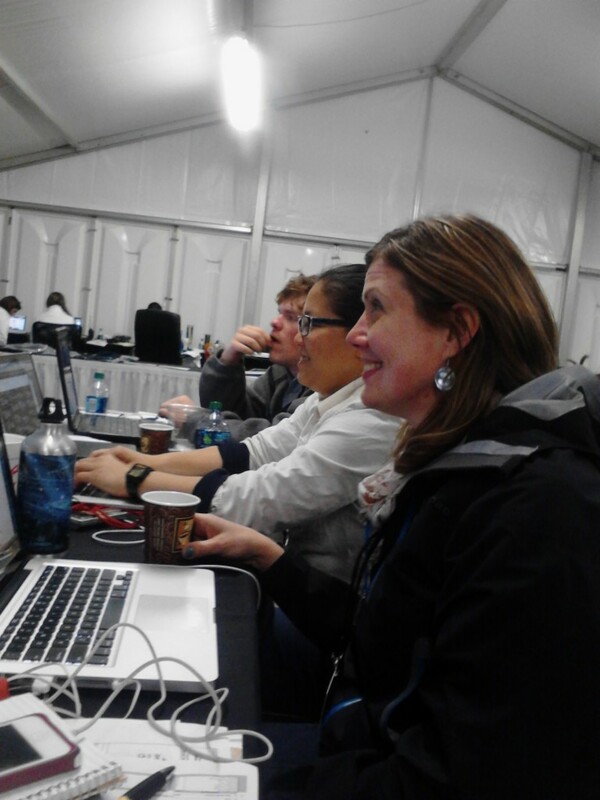 Here are my friends in the media center, Steph, Courtney, and Ben. Nerds. They put the interview times up on the dry erase board, but with players like JJ it doesn’t matter. She strolled in around 8 p.m, huddled in blankets. Because JJ. 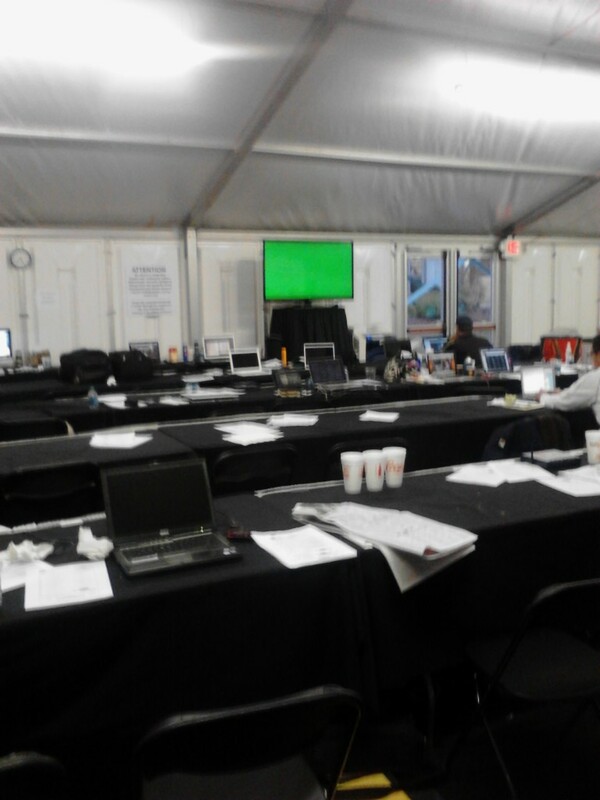 This is the media center. It’s glamorous. This is the press room. SUPER GLAMOROUS. This is JJ in her blanket in press. She said we couldn’t take photos because she didn’t have any makeup on. I know I’ve told this story before but it’s a good one so I’m going to tell it again. DEAL. 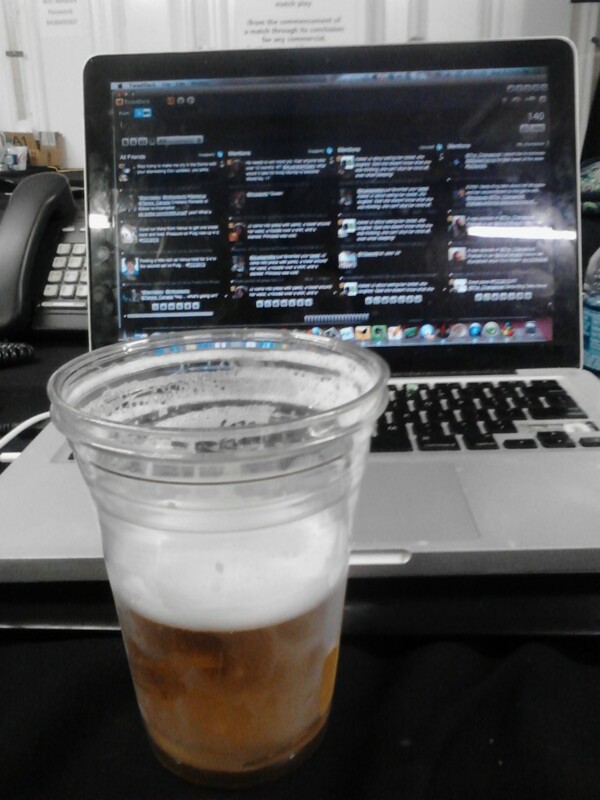 This is my beer and my laptop. There is a tap in here that starts flowing at 5 p.m. every day. Apparently it used to flow all day long, but last year someone got rowdy and ruined it for everyone. Lame. This is today. It rained. A lot. But someone was still practicing. Name that player. 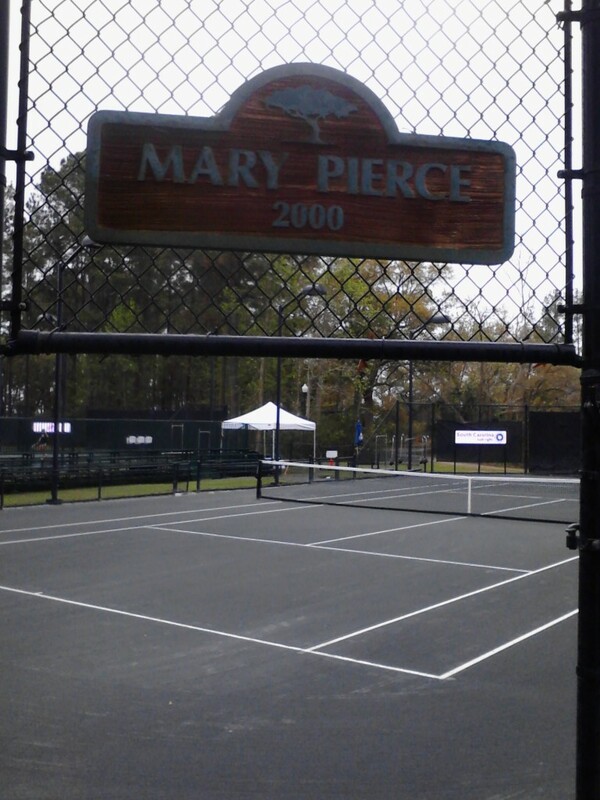 YOU GUYS, THERE IS A MARY PIERCE COURT. LEGENDARY. 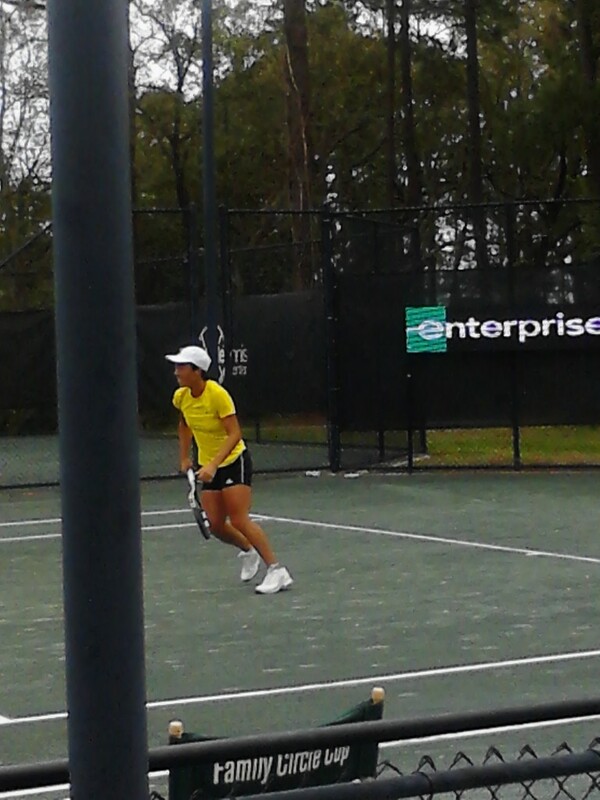 Ashleigh Barty is the player practicing in the rain. You need to get on Juan Jose about missing Oudin/Jankovic due to bad play by Muguruza. Keep the diaries going. Managed to catch a stream and before Stosur retired, Bouchard was playing very well but can she keep it going against Jankovic. Such a dream job you have: going to tennis venues, watching tennis matches, interviewing and getting to know players and writing about it! Would love to do that as a huge tennis fan and amateur writer (I hold a travel blog). Can I ask if you three guys of the Changeover earn some income by doing this (ads posted on the website or fees for writing for other tennis papers/blogs, etc…)? Basically, can you make a living out of it if you are not a fully contracted journalist ? Thanks for your answer, continue the blog, great stuff! THANK YOU FOR YOUR UPDATES! I love all your reports and share the same sentiments with you about most players! I want an article like this at every tournament, please. Fantastic. I can sympathise with you about the quality of pictures from an Android, but they provide a lovely insight into what’s going on in Charleston. 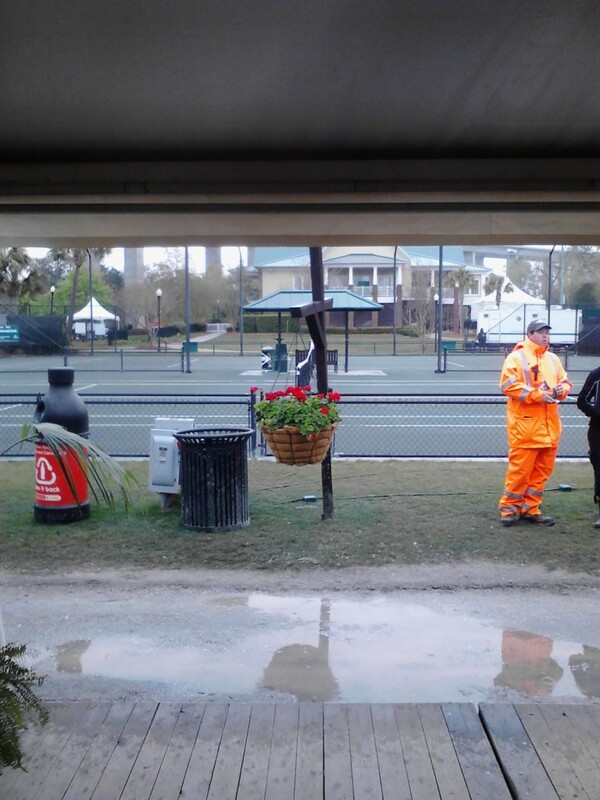 Your photo essay opens the tournament up beyond the green courts, and you’ve shown players whose earlier matches didn’t get broadcast here (UK). I’d forgotten Fran was even there. I’m still waiting for your JJ write-up though…! Thanks claire! It’s fun to tell stories. I’m going to write about JJ after the tournament, wait and see where she goes at the end of the week! Lovely Lindsay and more so with the touch of tease you have for us readers,my favorite part is still the Duvall “no you didn’t…” gesture on her presser:priceless! As for JJ I can’t wait till she gets back to winning day in day out because we all know how talkative she is, therefore more fun for tennis fans plus her signature smiles and on court theatrics,ohhhh just can’t wait!!! JJ,just I was expecting it again,the good play,the smiles, the theatrics,in a nutshell the great entertainment for tennis,right? at least according to some who like drama,well,there you go,Serena + JJ clashing?can’t be dull,for sure!